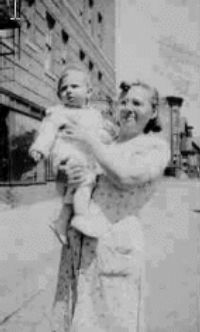 am looking at a photo of me in the arms of my grandmother, Ida Korman. It is May, 1936,and she is wearing her apron and standing in front of her candy store on the corner of Crotona Avenue and 179th Street, across the street from P.S. 92. Ida made great egg creams even though her specialty was malteds. I'm fairly certain that she was responsible for my lifetime addiction to egg creams. She had her recipe down pat. Her milk was always very, very cold. Of course she used Fox's U-Bet chocolate. She poured in the milk first and then added the seltzer very, very slowly, stirring as she did this. The chocolate syrup was added last to make sure it mixed properly with the milk. The work of a maestro at work. Very, very simple and delicious! Of course she supplied a long pretzel to continue to mix. For the first ten years of my life I spent alternate weekends with my grandmother Ida. I loved my grandmother Sophie as well but she didn't have a candy store. My grandfather Isadore was the man of the house who shared the candy store responsibilities with Ida. He was a very active member of his synagogue and spent considerable time there. His resemblance to Tevya in "Fiddler on the Roof" (Zero Mostel) was remarkable. It was as if they were identical twin brothers. His devotion to to his God and his family was commendable. He defended with vigor the culture and traditions that he grew up with. I can see myself on his leg as he bounced me up and down as he sang Yiddish melodies; utazoy candariga, or something like that. He was a bombastic and passionate man who came to this country before World War I to earn money so he could finish building his home on the Boog River in Kupel, Ukraine. He left Ida behind and they were separated for six years due to the freezing of immigration during World War I and the Russian Revolution. My father Sam, Uncle Max and Aunt Jeanette did not see him until 1920 when they finally arrived in New York. From Friday at sundown until Sunday afternoons I learned the culture and traditions so passionately held by my grandparents. On Saturday mornings I attended synagogue with my grandfather Isadore. In the afternoon, after a sumptuous buffet of cold cuts and cheeses, cold borscht and shav with sour cream (no cooking was allowed), we usually took a nap and then played old records of cantorial music. My favorite was "Rumania, Rumania" where you put your finger in your mouth and made a weird ?clucking sound'. After sundown on Saturday Isadore relieved Ida in the candy store and she cooked dinner. Various potato recipes were her specialties. My father, who worked in the meat business in Brooklyn, usually supplied very good skirt steaks. After dinner we played games. Ida taught me how to make a cradle out of string. She would form a rectangle in her hands with the cord and I would have to take it from her hands and transform it into a new form. Ultimately it formed a cradle. I laugh now how simple fun that was and kept us entertained. With the record player going in the background or the radio on it was a time to be together and enjoy each other's company. Of course my grandparents imparted the wisdom of the ages to make sure all the traditions and laws learned over many centuries were not lost on their grandchildren. Sunday mornings was the time when the whole family got together. After a feast of Lox, Eggs and onions and a variety of breads and delicious pastries it was time to play. In the back yard behind the apartment house was a small play area. That is where I learned to play boxball, slug, hit the penny and other games. At a very early age, I had my own treasured spaldeen. It's amazing how many games could be played with that spaldeen. Even if you had no one to play catch or other games with, you could dream up games you could play on your own. That spaldeen never left my pocket for many, many years. Even the girls had their spaldeen to play their favorite games with. By mid afternoon we were ready for Pinochle. Isadore was the master teacher to his children and his grandchild, me. I watched and learned with fascination as the strategy of the game unfolded. Toward the end of the game it could get quite passionate with the slamming of the cards on the table to emphasize a victorious strategy. It is remarkable that the table or some bones in the hand did not break during these games. After the game Isadore would hold a post mortem to school the players in the finer points of the game. Some times he could be brutal in criticizing his students. I can remember my Aunt Min getting chewed out after a particularly bad play and getting called "stupid, stupid - how could you play that card ?". We learned the hard lessons of how to compete and win in Pinochle. Isadore usually took a "tea break" which he delighted in turning into an Academy Award Winning performance. It is remarkable looking back that drinking tea could be deemed a performance. Ida would bring the tea to him almost boiling. Isadore would pour some of the tea from the cup into the saucer. He would slowly lift that saucer to his face and very slowly sip that steaming hot tea through his lips. The sucking sound that he made was comical in that it was so noisy. He then gave a deep sigh of satisfaction that you could hear from a long distance. That was followed by a shot of schnapps which warmed the stomach and the soul. Of course a loud exclamation of L'Chaim ("To Life") was required. We wanted to make sure our God was listening. After threading the needle for Ida on her foot powered sewing machine it was time to go back with my parents. Of course I had to have one more Mondel brot to dunk in my tea before I left.